Researchers have discovered that there is a very small, but significant association between birth defects and use of nasal decongestants in the first trimester of pregnancy. 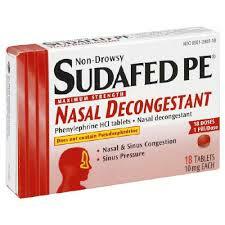 Unfortunately, decongestants (ie sudafed, afrin, etc) are also one of the most popular medications purchased over-the-counter to treat symptoms of nasal congestion, runny nose, and allergies. Although these associations were related to ORAL decongestant use and first trimester intake, it was also found that intra-nasal decongestant use during the first trimester was associated with pyloric stenosis and tracheo-esophageal fistula. Taken in summary, it is perhaps ideal that women in their first trimester of pregnancy avoid decongestant use due to a possible association between birth defects and medication usage. This association accounts for a VERY small percentage increase in birth defects and as such more study is needed. For example, the baseline prevalence of endocardial cushion defect is 0.34 per 1,000 live births. Phenylephrine exposure increases this risk 8-fold resulting in 2.7 per 1,000 live births. That's an overall increased risk of only 0.27%. So what is a pregnant woman to do if her nose gets all stuffed up and wants to avoid decongestant medications to eliminate any possible risk of birth defects? Click here for some suggestions.